I am often communicating to prospect ESL teachers in China. Those talks often sprawl through the days like new urban centres through the once countryside of the Middle Kingdom. What have I learnt from this talks? Not much, but they helped me look into my peers’ and my very own experience and pin the worst and best aspects of living in China as an ESL teacher. I’d rather finish off with the pros, let’s start with the cons then. You probably don’t know this expression if you or your friends have never lived here. To put it bluntly, China can drive you crazy at times. The culture of a far away place is often a far one from yours, let alone in a country that “enjoyed” partial/complete isolation during recent history and is now experiencing an economic boom. A cultural experience comes at its cost: dealing with people who think, behave, express themselves differently can literally turn normal day into a bad China day. You’re gonna get headaches: “Why does that guy do that thing in this way? It’d be much better and effective to do it otherwise. WTF, he says ‘yes’, but he keeps doing it the way he was doing it.. Why the hell is he not listening to me? this is so stupid!”. On top of this, the bureaucracy this country throws on a person can be overwhelming, often non-sense and time consuming, whether you can speak the language or not. Luckily, this is a weekly or bi-weekly occurrence for me. It’s worse for some. I’ve recently, at least partially, tackled this. Most ESL teachers live in humongous cities, where you’re happy when PM 2.5 levels are just around 100. On a scale from green to purple, your APP shows it with an orange colour and a “Unhealthy for Sensitive Groups” caption. Just above that, the red colour simply reads “Hazardous“. How have I tackled this? I moved from Chengdu, a great city with crap weather and dreadful winters that last 5 months with average PM 2.5 levels of 150-250, to Nanning, a smaller city near Vietnam with much cleaner air, green streets and huge parks within the city. The levels here are as the same, if not lower, as most big cities in the West for great part of the summer. The summer lasts from April to October. 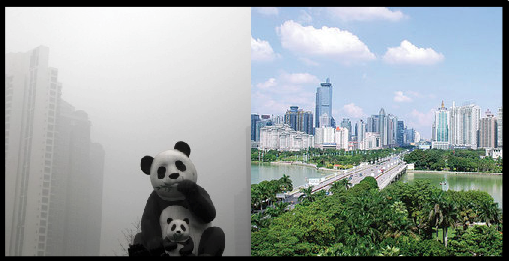 The remaining 5 months share the remaining 3 seasons, when pollution levels get higher, but are still low from a Chinese perspective. This is a tricky one. It can be both a positive and negative aspect of life in China, depending on the situation and the people you have around. Your employer will often see and treat you as a “high-selling product” more than a professional who loves his job. You having a western face explains the high tuition fees of the school. When on the streets you’ll get long and unashamed stares, some people will even get as close as touching your beard and hairy legs (especially the kids). Nothing bad in this, it’s all curiosity, but it can easily become frustrating when you are trying to seriously make a point to someone or to simply be left alone in a park to relax. If you know Chinese then you’ll also hear plenty of people talking about you, how weird your body is and how weirdly you act or parents pushing their kids to come and talk to you. “Go YiFei, go. Talk to him, you learn English at school everyday!”. In a country where foreigners are far less common than in most countries on Earth, being a foreigner has its fair share of privileges. You get free drinks in many bars and clubs, especially in smaller cities, since you being there raises the bar’s reputation. Ok, you’re a marketing tool in this case, but I would not complaining. Also, being a foreigner you often can easily “ting bu dong your way out of troubles“. What’s ting bu dong? It means I don’t understand. An example: say that the Police stops you for driving with your electric scooter on a road which is forbidden to anyone else but cars and trucks? Tell the police officer “Ting bu dong…”. After a few minutes they’ll let you go as they can’t speak English and don’t want to be bothered to keep you there for hours trying to explain something. Hospitality. I find China to generally be the most hospitable country I’ve ever been to, especially if you look like you are from the West. People will love to bring you around, have their grandma cook for you, pay for your dinner, help you if need something etc. China is as huge as its food is diverse. If you live in a well-sized city, you’ll have loads of eating options. From the hand-pulled noodles of Lanzhou, to the Fujian dumplings, to the spicy and numbing flavours of Sichuan’s restaurants, to the sour and spicy ones of Guizhou’s cuisine, to the sweet flavours of Guangdong’s dim sum, to the lamb skewers of Xinjiang, to the Hunan spicy barbecue, to the…. the list is probably infinite so I am gonna stop here. I’ll let your tongue be the judge you you ever come to China. After all, this is all from an ESL teacher’s perspective. It’s time to talk about them, the kids you see every week. I teach mostly kids from 3 to 10. I love most of them and I make sure the ones I don’t like don’t realise that. Students in China are curious and happy to have a foreign teacher. In my school I teach no more than 4 in a room and we focus only on communication skills. Therefore, I create strong bonds with them. I am also aware I often am their first contact with the outside world and I love to give them as much as possible. What do they give you in return? They often make your day. I remember a few months ago I was having a really Bad China Day, then one of my little students came to the school and started messing around with me, with a smile as big as the whole of China and contagious happiness. They often also make you proud of what you are doing. Teaching kids means you teach complete beginners. After 6 months or little more, you’ll be astonished by how well some of them can interact with you and other foreigners in English. This will make you understand your work not only gives you a salary, but helps shaping the lives of those that one day will be adult in China. Or at least some of those. Enjoyed this post, I’ll be teaching either in or near to Chengdu next year!